Telescopes are an amazing invention. They magnify everything we point them at, allowing us to see small features of the objects. They also collect more light than the human eye does, revealing faint and far-away celestial things. Because light is more than what we see, there are special telescopes that can detect the invisible to our eyes radiation that comes from the sky, such as radio waves! And today we would like to tell you all about the World’s biggest single-aperture* radio telescopes: the coolest, the biggest and the weirdest! Arecibo telescope is a huge 305 meter dish that sits in the natural limestone sinkhole in Arecibo, Northwestern Puerto Rico. Until 2016 it held the title of the biggest telescope in the World. In 2018 Arecibo celebrates its 55th anniversary! Scientist use Arecibo telescope to explore radio waves coming from really far-away space objects, like pulsars, supernovae and galaxies, to study the atmosphere of the Earth and, with the help of a radar, to explore and to keep an eye on asteroids, moons and planets in the Solar System! The radio waves coming from space are collected by a spherical (not parabolic) dish made of nearly 40 000 separate panels. The light that bounces off the panels is then caught and focused by a receiver, a Gregorian dome suspended on cables 150 meters above the surface of the dish. Arecibo can do something that other radio telescopes cannot: as well as receive a signal, it can transmit it! The observatory includes a powerful radar that can beam radio signals to the different objects in the Solar System, like asteroids and planets. Astronomers can catch the signal reflected off those objects with Arecibo dish and learn about the objects shape, composition and distance to the Earth! On Nov 16, 1974 the Arecibo radar made headlines when it sent its famous Arecibo Message into Space. The message was composed by astronomers Frank Drake (the author of the Drake equation), Carl Sagan and others and contained the information about the Earth and humans. Included in the message were numbers one to ten, the atomic numbers of the most abundant chemical elements, the picture of the Solar System (with the Earth’s position marked) and the drawing of a human. The message was transmitted in the direction of the Globular Star Cluster M13 in the constellation Hercules situated 22 200 light years away from the Earth. Whether or not M13 will still be there when the message finally arrives, is not 100% clear. Will the alien civilization ever receive and translate the message? Arecibo is famous for the numerous discoveries it made during the 55 years of observations, including the one leading to the Nobel Prize, “the discovery (of a new type of pulsar)…that has opened up new possibilities for the study of gravitation” by Hulse and Taylor. Before Arecibo, astronomers thought that Mercury, just like the Moon, exhibits synchronous rotation. It means that it takes the same time for Mercury to orbit the Sun and to spin on its axis. But the telescope’s observations confirmed that Mercury rotates faster than it orbits the Sun (59 days vs 88 days)! That was a big surprise! Arecibo was the first to spot exoplanets, millisecond pulsars and even the mysterious fast repeating radio bursts! And the coolest thing? Arecibo is the “open skies” facility. That means that not only the scientists who work on the telescope can do the observations, but researchers from all over the World can apply for the instrument time! Here is a short Arecibo video that will tell you more about the mighty telescope and how it helps scientists explore Space. Or, if you are ever in the area, just pop in! Visitors are welcome! Five-hundred-meter Aperture Spherical Radio telescope, or FAST, is the newest and the biggest filled radio dish in the World! It is situated in the rural area in Guizhou, Southwest China. The great dish sits in the 45 million year old crater surrounded by the mountains. Prior to the construction, engineers had to relocate the population of the region in order to create a zone free from human radio interference. Unfortunately, the telescope became a very popular destination with tourists which causes a great concern among scientists about the area remaining a radio-quiet zone. Since the start of its operation in 2016, FAST have spotted nearly half a dozen of new pulsars. Astronomers expect many groundbreaking discoveries from FAST in the future. We hope that the international astronomical community will be able to use the telescope time too! The dish of the telescope consists of 4450 separate metal panels. Underneath the panels is a cable network that can push the panels and manipulate the shape of the dish. This unique technique allows the telescope to aim at different targets! Six cables hold the receiver suspended 140 meters above the surface of the dish. Watch this video to learn more about FAST and to meet some of the scientists and engineers behind the project. RATAN-600 stands for “Radio Telescope of the Academy of Science 600 meters”. The telescope is part of the Special Astrophysical Observatory (SAO) situated in Caucasus Mountains in Russia. RATAN-600 saw the first light in July 12, 1984. Therefore next summer the radio telescope will be celebrating 34 years in operation! 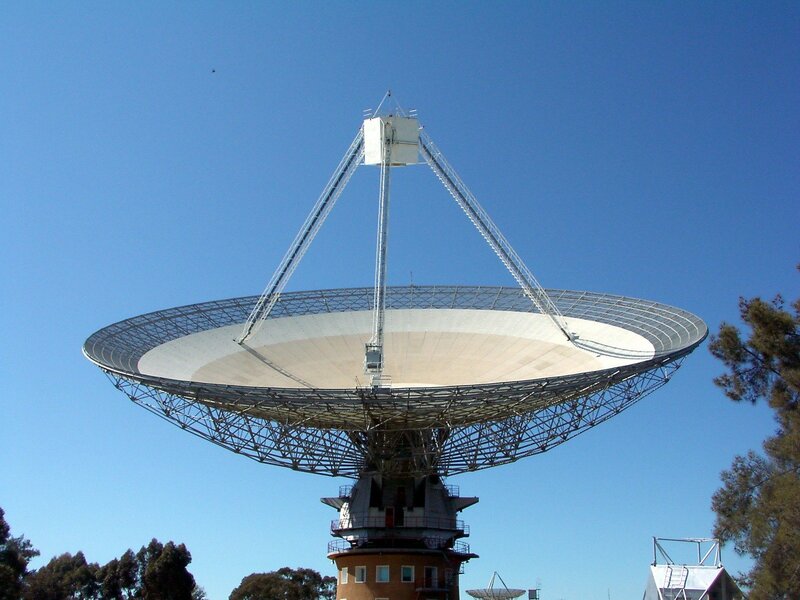 As the name suggests, the antenna of the telescope has a diameter of nearly 600 meters. So technically it is the biggest of the three radio telescopes. But there is a catch! RATAN-600 is not a filled dish, but…well…a circular fence! Therefore its total collecting area is much smaller than that of the first two radio telescopes. Like Arecibo, RATAN-600 is an “open skies” observatory. Astronomers from all over the World can submit proposals for the telescope time. Scientists use the telescope to observe the Sun (especially solar corona), solar system objects and far-away radio sources. The antenna of RATAN-600 is a ring that consists of of 895 elements. Inside the circle are four “feed cabins” with secondary mirrors. The telescope can use either a section of elements (in that case different sections can observe different objects), or the whole ring. The effect of the latter is almost as if we used a single dish 600 meter big. Unlike the fully steerable radio telescopes, RATAN-600 is a transit instrument. That means it uses the rotation of the Earth to scan the sky. Watch this video to see the radio telescope as well as the optical telescopes of the Special Astrophysical Observatory. Any questions? Let our inflatable planetarium team know!